Today, I’d like you spare a thought or two for the humble frog. While they’re not the brightest of beasts, given that frogs live on land and in the water, and have semi-permeable skin, they are very sensitive to pollution and other changes. This makes them a good bellwether for the environment. That’s why FrogWatch Canada wants your help. Researchers have set up a nationwide program to gather data on frogs (and toads), in an effort to track populations over time. According to the FrogWatch site, the most effective way to track changes in frog and toad populations is to listen for their calls during mating season in the springtime. To participate in this citizen science project, you first need to go to the website for FrogWatch and select your province, and then click the How To FrogWatch link in the menu. Then you’ll be presented with instructions specific to your area. 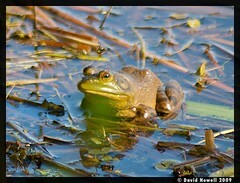 In Ontario, for example, frogs and toads are active between March and August, and the site suggests that you monitor from spring in your area until about June. All you need to do is listen for them once or twice a week, and then fill in and submit a FrogWatch observation form. You’ll report on roughly how many frogs you hear, and when you hear them. If you live near a waterway already, or plan to spend time at the cottage this spring, this is a really easy way to contribute to conservation efforts. It’s also a great project to do with your children.